ALICE GAZDICK (nee Tatar) age 94. Beloved wife of the late George A. Sr; dear mother of George, Jr. (Lois) and Dennis E. of Florida; loving grandmother of Avis (Dean) Gallam, Lawrence and George C. (Susan) Gazdick; great-grandmother of Vincent, Philip and Eric Gallam, Claire (Elliot) Volkman, Curtis, Elizabeth, George C. Jr. and Max Gazdick; sister of Gizella (Roger) Gonder of Huron and the late Ethel, Flora, Andy, Steve, Frank and Rose. Funeral service 12 NOON SATURDAY at Brooklyn Reformed Church 9014 Biddulph Rd. Brooklyn, 44144. The family will receive friends 2-4 AND 6-8 PM FRIDAY AT BODNAR-MAHONEY FUNERAL HOME 3929 LORAIN AVE. CLEVELAND. Interment Lutheran Cemetery. The family requests contributions to Brooklyn Reformed Church. Alice received the “Army-Navy Production Award” emblem from Franklin Delano Roosevelt for skill, industry and devotion on the production front of World War II. While employed at National Tube Co. she made the very first jet engine for planes. 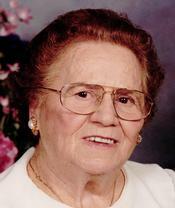 She was a church organist for over 45 years.